If I were to ask you what is the holy trinity in an Italian kitchen, what would you say? No, nice try, guess again. I’m sure you can get the right answer. No, but you’re getting close. Okay, I’ll just give you the answer. 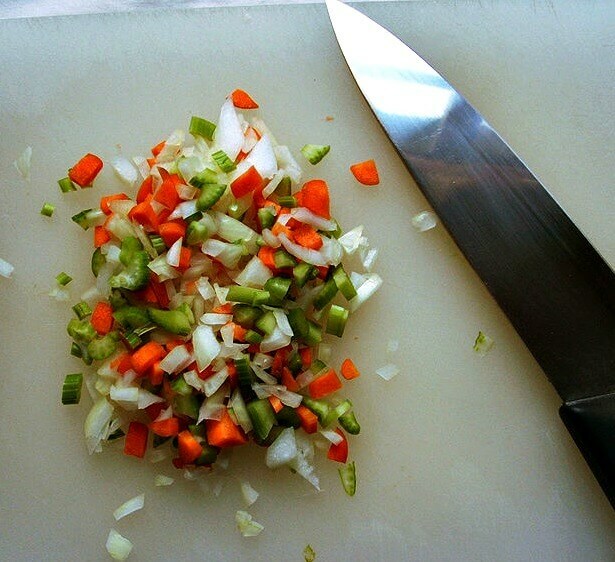 It’s soffritto — a combination of onions, carrots, and celery that is sautéed gently in olive oil. The word soffritto in Italian means “under-fried” or “fried slowly”. You’re probably going to say that in France it is called mirepoix. That’s true. But the French term can mean the raw cut or cooked vegetables. The Italian term refers only to the vegetables sautéed in olive oil. In France, the mirepoix usually sautés in butter. The term odori refers to the herbs or the onions, celery, carrots, etc. that you will add to flavor whatever you are making. The word odori means fragrances or scents because technically that is what you do — you season your dish with wonderfully scented vegetable and herbs. 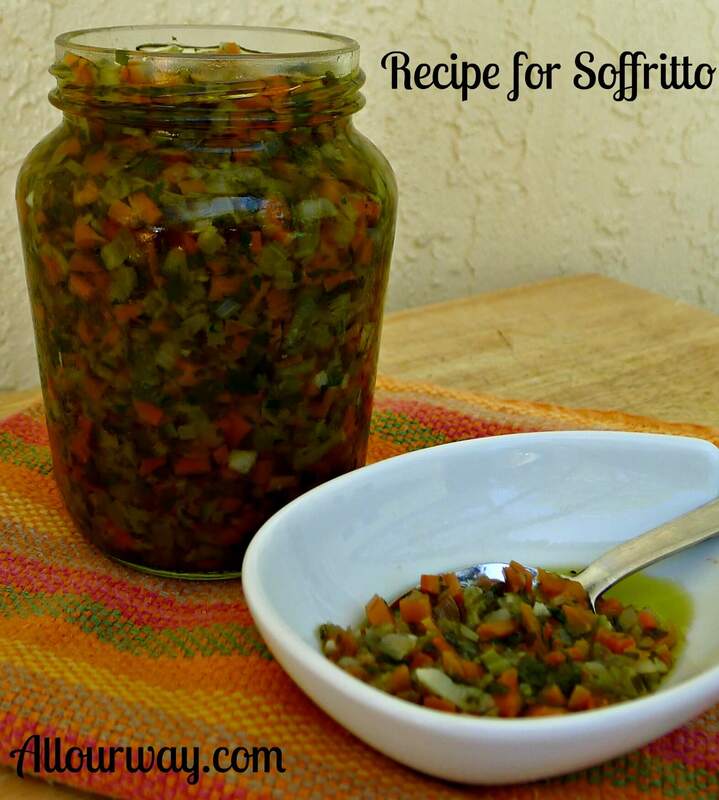 Think of the soffritto as a base that you will build on. You can add garlic, Italian parsley, fennel bulb, herbs, wine, mushrooms, peppers. . . the list is endless. This can be a base for greens or you can add it to braise meat or vegetables. It’s great as the base to a gratin of summer vegetables. The ratio for the soffritto is always the same 2:1:1 with onions having the largest amount. You will need to use sufficient olive oil to cover the diced vegetables. This is really a handy recipe to have on hand. It can save you lots of time. If you’re dicing, why not make extra? You can keep it in the fridge for a week or freeze it for up to 6 months. Strain off some of the oil before freezing the soffritto and then use the flavored olive oil in other recipes. This is a combination of three aromatic vegetables: onions, celery, carrots. 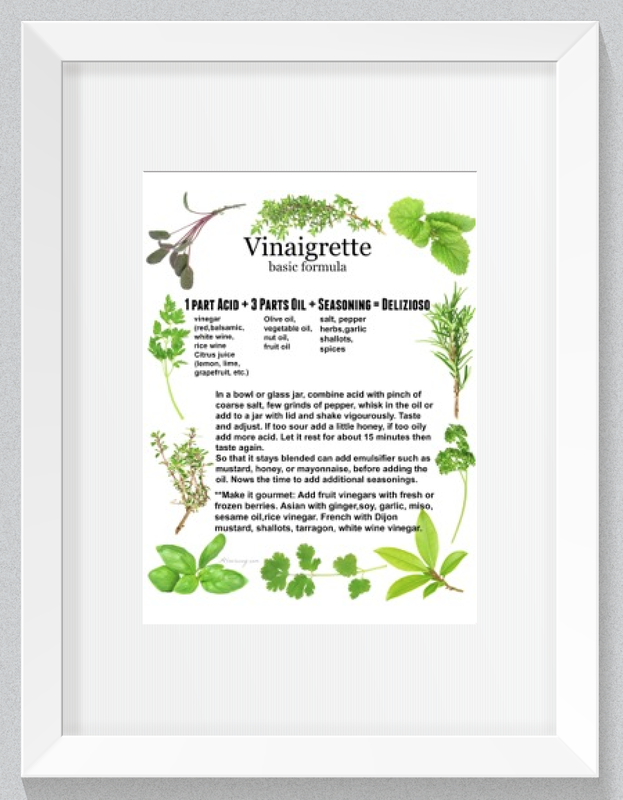 This is just a base whereby you add additional herbs and spices that are to your liking. Heat a large pan ( a sauteuse with high sides works well ) over medium heat. When warm, add the olive oil. When the olive oil starts to warm, add the vegetables and stir to coat all of them with oil. Cook gently, stirring often to prevent sticking. You may have to turn the heat down because you don't want the vegetables to brown. The vegetables should turn a golden straw color. It can take up to 45 minutes. When the vegetables are a golden wheat color, the soffritto is ready. You can refrigerate or freeze it until needed. Keeps a week in the refrigerator or 6 months in the freezer. Remember the ratio is: 2:1:1 with enough olive oil to cover the odori. You can make as little or as much as you wish. It is very handy to have extra on hand. If you are going to freeze, strain off some of the oil and the soffritto will freeze better. You can use the oil in other recipes. You can regulate the color and texture of the soffritto by the amount of time you sauté it. It is! If you’re cutting away might as make extra :-). You are right!! It’s a very versatile recipe. 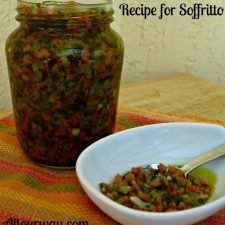 Marisa: I just love this idea of making soffritto ahead of time, and storing it in oil in the fridge or the freezer! What a time saver this is going to be for those days when you really don’t have time for all the chopping……….. Thanks for this post! I love to cook on rainy days — with spring and summer (hopefully) coming soon we’ll want to spend our time outside so this does help. Enjoy! !